Tide overflowing the road in Elliott's Island, MD. Credit: Guy Willey Sr.
Transportation systems are vulnerable to climate change, like all infrastructure. Increased storms and warmer temperatures challenge paving and structural elements that support roads. Floods undermine bridges and sweep through subways. Excessive snow makes management of all systems more difficult. All of these effects are expected to intensify under climate change. As a result, good planning suggests that the Transportation Improvement Plans (TIPs) should address climate adaptation. A TIP is a multi-year program of capital improvements that reflect the needs of the regional transportation system. Regional TIPs are prepared by Metropolitan Planning Organizations (MPOs), which cover the whole state. Each MPO works closely with its constituent communities to identify their TIP priorities. In addition, the MPO evaluates the needs of the overall region. Under federal regulations, the TIP must be constrained to available funding, consistent with the long-range Regional Transportation Plan, and include an annual element, or listing, of projects to be advertised in the first year of the TIP. The regional TIP has a highway component and a transit component. These regional TIPs are used to prepare the State Transportation Improvement Plan (STIP). Typically, these statewide transportation plans will review the mission and vision of the agency, agency policies and their connections to programs and projects, the condition and need of agency-owned and managed infrastructure, and the sources and uses of transportation funding. Statewide plans will often identify major proposals for transportation projects, as well as important corridors for future growth and development. For additional information, review the MassDOT Highway Division Project Development Guidebook and Transportation Improvement Program. 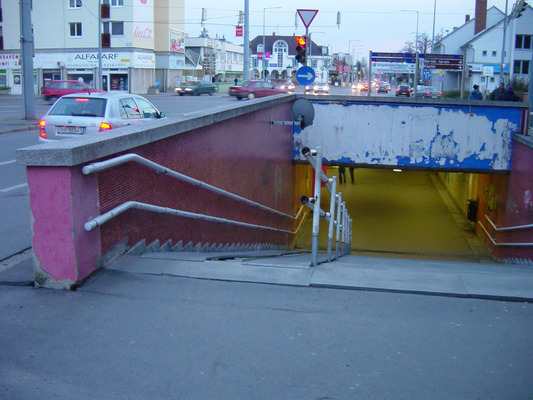 Bike- & skateboard-friendly entrance to a subway in Budapest, Hungary. Credit: Ben Fertig/IAN UMCES. Mitigation is an important and established goal for STIP and for TIPs – transportation is a significant source of greenhouse gases that create climate change in the first place, and TIPs should seek to promote energy efficiency. Investing in public transit, pedestrian-friendly design, and bikeways are all important to reducing the energy-intensive automobile-focus of our US transportation system. In terms of adaptation, there is less clarity. 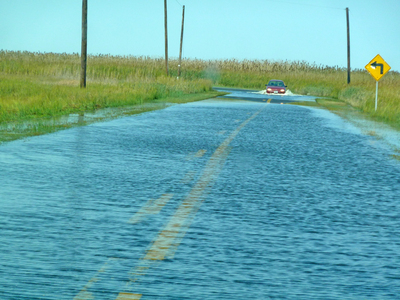 The methods for addressing climate adaptation into TIPs are not yet well developed, although the Federal Department of Transportation has work underway on this topic. A 2014 US DOT report, for instance, is entitled “Ensuring Transportation Infrastructure and System Resilience” and reviews opportunity in that federal agency for including climate change into its work. At this time, we suggest that communities, regional agencies, and even the state agency watch this area closely for policy changes and innovation opportunities. It seems prudent that project specifications should be based on future climate, but the actual practice of making this happen is not well established in transportation projects in general. At the state level, the General Laws appear to enable consideration of climate change in TIPs and the STIP. Title II, Chapter 6 C, concerning the Massachusetts Department of Transportation in its Section 10 of the Office of Transportation Planning establishes that “the office of transportation planning shall be responsible for research and planning in coordination with the executive office of energy and environmental affairs on issues related to historic, current, and projected future transportation-generated emissions of carbon dioxide and other greenhouse gases and technology, policy, and legal issues related to developing and implementing market-based compliance mechanisms for transportation-generated greenhouse gases.” Part of the recommendations consider the inclusion of comprehensive climate adaptation planning for roads and infrastructure in the planning process, in order to be more sustainable and resilient to increased temperatures and storm-water changes. Still, it is not always easy to influence the STIP as a citizen, or even as a municipality, in part because transportation project decisions are often made years before work actually starts. Each year there will be hearings for the regional TIP which are open to the public, and to which municipal officials are invited. Because few citizens attend these, those who do engage may have significant impact on processes if they can time their input to the pre-design stages of a project. Once a project is approved in the STIP, the community can start the permitting process that involves an environmental study with details of the preliminary design and funding proposals. At this stage, municipal boards will hold hearings where citizens can also play influential roles and ask how a changing climate has been included in project specifications. The Transportation Enhancement (TE) activities offered funding opportunities to help expand transportation choices and enhance the transportation experience through 12 eligible TE activities related to surface transportation, including pedestrian and bicycle infrastructure and safety programs, scenic and historic highway programs, landscaping and scenic beautification, historic preservation, and environmental mitigation. The CMAQ program was implemented to support surface transportation projects and other related efforts that contribute air quality improvements and provide congestion relief. Administered by FHWA, the CMAQ program has been reauthorized under every successive Transportation Bill up to and including the FAST Act in 2015. Through the close of the MAP-21 period in 2015, the CMAQ program has provided more than $30 billion to fund over 30,000 transportation related environmental projects for State DOTs, metropolitan planning organizations, and other sponsors throughout the US. U.S. DOT Federal Highway Administration (FHWA). (2014). We Move Massachusetts.